This week, we set one of our work experience students Milly, the task of seeking out the gossip from the building site that is our Oxford Road building. 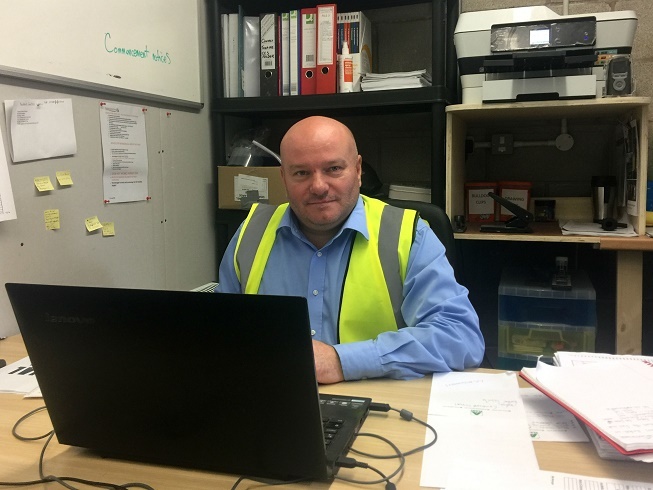 Armed with a hard hat, a note book and a set of probing questions, we met Steve, the Site Manager of our Making Contact building project. Brilliant! Good to know our building is in great hands. So… what does a site manager do? Everything! From managing the Health & Safety on site to ensuring everything is built as per the drawings, specification and quality, right through to handing over to the end user. Wow, it’s a really important job, especially in such a big project like this one. How did you end up being a site manager? Was it something you always wanted to do? I completed my apprenticeship as a joiner before moving into bar & shop fitting, high value housing, hotels & exhibitions and progressing through Foreman to Site Manager. Do you work with apprentices on site now? Yes we have a 2nd year apprentice joiner on site at the moment and have taken on a further 1st year apprentice joiner recently. Many of our sub-contractors also have apprentices. What sorts of skills do they learn on a project like this? Contact Theatre is an unusual project with many very theatre based systems, recording suite, sound & light etc. What advice would you give to a young person who wanted to work in the construction industry? Try and get a work experience placement while at school, Parkinson’s do many of them every year. We have already had a young lad Paul Hine at Contact Theatre for a week earlier this month. You’ve obviously worked on a lot of different types of buildings. Have you worked on a theatre before? Does that mean that working on Contact is very different to other jobs you’ve had in the past? Initially no, but as we progress with the Audio Visual fit out the specific kit will be very specialist. Ooo, can you tell us any more about this specialist kit? It is sound and lighting systems that are a lot more high spec than my surround sound at home. Luckily we have our Sub-Contractor, Whitelight, who will install the systems and know a bit more about it than me. Do you have a favourite building or project that you have worked on? Many over the years for many different reasons but Tatton Dale Farm Field to Fork Project was particularly nice to work on. Having to work with the farm staff, animals and 10,000 school children and visitors over the summer holiday last summer. Very challenging but was a great experience. That does sound like a lot of fun but when you’re not managing building projects, how do you like to spend your spare time? Do you go like going to the theatre? Yes, unfortunately I don’t get to the theatre very often these days. If your life was a musical, what would it be called? Who would play you? What would the opening number be? I will have to get back to you on that one.